More than putting inexperience on display or showing incompetence in governance, the Modi government seems to be playing electoral politics with regard to fresh relief to the survivors of the 1984 Sikh massacre. Three assembly by-elections were announced and the BJP hoped to gather the necessary numbers to form a government in Delhi. When a scientist recently cautioned that unplanned haphazard construction in the hills can lead to a repeat of the Kangra quake of 1905, wreaking havoc in the state, it should have been a wake-up call. Similar warnings issued by Disaster Management Authority officials and environmentalists have been ignored with impunity. The state lies in the seismic zones IV and V.
BY all accounts poor infrastructure is the biggest stumbling block for achieving higher economic growth. Lack of roads, highways, power, ports, airports and water has acted as the main deterrent to attracting foreign direct investment, especially in the South Asian region. Our neighbour’s son is a financial wizard. He is rarely seen during our waking hours whenever he is on a short visit from abroad. But whenever he is sighted, his father promptly calls me. He feels that our combined wisdom would make it easier to assimilate whatever he mumbles in his ever pre-occupied mode. 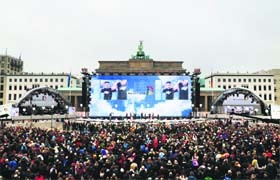 ON 9th November, Europe, and particularly reunified Germany, celebrated the 25th anniversary of the fall of the Berlin Wall. The event reminds us yet again how pernicious for common people the ideological divide leading to the cold war had been under which the world, for most of the 20th century, suffered. But fortunately, the event also reassures our faith in the peaceful exercise of peoples' power. More than putting inexperience on display or showing incompetence in governance, the Modi government seems to be playing electoral politics with regard to fresh relief to the survivors of the 1984 Sikh massacre. Three assembly by-elections were announced and the BJP hoped to gather the necessary numbers to form a government in Delhi. The model code of conduct was in force when a Home Ministry official announced on October 30 — as Sikh organisations prepared to observe the riots anniversary — that “the NDA government has decided to give Rs 5 lakh each to the next of kin of those killed in the 1984 anti-Sikh riots”. The print and electronic media gave wide coverage to the announcement. Sikh representatives welcomed the relief but pointed out that justice was more important. When the Election Commission objected to the announcement, which could “disturb the level-playing field” in the ongoing by-elections in Delhi, the real face of the government emerged. The MHA claimed that no decision was taken regarding compensation. If no decision was taken, they why were news reports not denied the next day? The Election Commission too has raised this question but let off the government lightly by asking the Union Home Ministry to ensure that “such instances do not recur in future”. Obviously, the announcement was made to influence the riot victims in the crucial by-elections. It is another matter that subsequently the by-elections were cancelled since the assembly had to be dissolved. The attempt to mislead people was evident at another level. No fresh relief of Rs 5 lakh has been announced. Only the quantum of relief has been “increased” to Rs 5 lakh and it is not just for the Sikhs but all “civilian victims of communal, terrorist and Naxal violence”. In 2006 the UPA announced a Rs 717-crore rehabilitation package for the Sikh riot victims. Accordingly, the next of kin of each victim was paid Rs 3.5 lakh. The Modi government has now raised that ex-gratia amount to Rs 5 lakh and tried to make political capital out of it. The move has apparently backfired. When a scientist recently cautioned that unplanned haphazard construction in the hills can lead to a repeat of the Kangra quake of 1905, wreaking havoc in the state, it should have been a wake-up call. Similar warnings issued by Disaster Management Authority officials and environmentalists have been ignored with impunity. The state lies in the seismic zones IV and V. The capital leads the way to unplanned growth and towns like Kullu and Dharamsala follow. Shimla's precarious location on a steep ridge in this earthquake-prone region, combined with weak construction techniques and a burgeoning population, put it at serious risk of an earthquake disaster. Buildings and roads in Shimla as well as sidewalks have been constructed on steep slopes. And the growing population has not been taken into account. A study conducted by IIT professionals from Mumbai and Madras reveals that if an earthquake hits the state with its epicentre in Sundernagar-Mandi at midnight, 17 per cent of the total 8.13 lakh population in Shimla district would be injured. The government remains oblivious to such warnings. Or else what is the rationale behind regularising illegal constructions, as was recently announced? An ordinance to amend the Town and Country Planning Act will be issued soon. To what extent the safe building norms are complied with is anyone's guess. As it is, only a mere 2 per cent of the buildings in the state are earthquake resistant. New construction invariably has the same structural problems as the existing weak buildings. Building safety standards require non-shrink grouts and fibre -- reinforced plastics to be incorporated for repair, restoration work and strengthening. A damageability assessment of buildings should also be undertaken, along with an assessment of retrofitting requirements. Seismic belts around door and window openings are a must. However, multi-storey structures remain concrete monstrosities that are architecturally unsound and aesthetically an eyesore. In the event of a temblor measuring 8 on the Richter scale, the state capital may collapse like a pack of cards. Does anyone care? THE Canadian correspondent of the Pioneer in his letter dated 20th September refers to the part India is taking in the war in the following terms: It is impossible for me to state in proper terms the enthusiastic appreciation felt in Canada of the magnificent offers of help made by the Princes of India to the King-Emperor. Canada has for some time previous to the outbreak of the war been hearing much of sedition in India, she had her coast invaded by people of that country contrary to all rules and regulations, and it was natural perhaps that those who knew nothing of India should have had some misgivings as to what India's attitude would be. But when we received the report of the scene in the British House of Commons — when the announcement was made of the offer of the personal services of 700 Indian Princes of their men, their arms and their treasure — it was read with unbounded pride and satisfaction. He then points out how magnificently the British Empire is knitted by a common bond and how completely every unit of the Empire has falsified the wrong opinions and miscalculations of Germans. ACCORDING to a statement recently laid on the table of the Imperial Legislative Council, except in Bombay there have been no female medical diploma-holders. In Bombay 44 lady graduates hold medical qualifications and in Madras there is only one. The other provinces have none whatever and it is a poor sign of advancement of female education. Whether sufficient facilities are not given for inviting candidates or whether social and other impediments account this paucity has not been stated definitely. The first initiative to address the needs of developing and emerging market economies for infrastructure was the establishment of the New Development Bank by BRICS in Shanghai. This was announced at Fortaleza, Brazil, in July 2014 and marked a paradigm shift in the global financial system towards a new economic order in which the role of the IMF and the World Bank will be considerably diminished. And now the creation of the Asian Infrastructure Investment Bank (AIIB) has reinforced the trend. The AIIB was announced October 24, 2014, by China along with 20 other Asian countries which signed the MoU. The bank will be functional from 2015. Undoubtedly China wants to be the global leader in the global financial architecture and has the means to do so. It has huge forex reserves ($3.3 trillion) and has experienced steady growth for more than three decades. In the past, developing countries relied on Asian Development Bank, the World Bank and the IMF for their financial needs which dominated the multilateral lending operations in the world. The IMF and the World Bank especially laid down conditions for their loans given to developing countries which often meant deviating from their own development agenda. Reforms included strict adherence to fiscal deficit goals, privatisation, opening up the economy, cutting subsidies and government expenditure. But today the developing countries are increasingly turning towards China to aid them in their quest for building infrastructure. And China has been helping Pakistan, Sri Lanka, Nepal and Bangladesh in building roads and ports. As for India, the AIIB is going to offer further options and availability of finance for its immense infrastructural needs. India will need $1 trillion for five years beginning 2014-15. The AIIB has all our neighbours as members and also include central Asian countries like Mongolia, Kazakhstan and Uzbekistan. All need a huge amount of money for infrastructure development and with paid up capital of $50 billion and authorised capital of $100 billion, there is scope for loans for the entire region. Basically the two banks-NDB and the AIIB — will help in creating a new financial architecture that is based exclusively on the development needs of global South. It will be catering to their development goals but the governance and operating principles will naturally take time to be established. Gradually with a much more democratic set-up, the set of 21 countries may wean from the multilateral financial institutions like the IMF and the World Bank and ADB. The World Bank and ADB are of course much bigger and well established. ADB, which has Japan as the biggest stake-holder, has a subscribed capital of $162 billion and the World Bank has $233 billion. Both give loans for diverse projects to governments as opposed to the AIIB, which will lend only and exclusively for infrastructure projects. President Xi Jinping recently said: “I believe the setting up of the AIIB will be an enrichment of existing multilateral institutions. We have to learn from the World Bank and ADB and other existing multilateral development institutions their good practices and useful experiences”. But there is no doubt that the AIIB is set to give competition to the World Bank dominated system. What has united the developing countries is the fact that the IMF has not undertaken reforms in its voting rights and quotas that BRICS demand. Under the IMF quota system, each member country is assigned a quota or monetary contribution that is supposed to reflect the country’s relative size in the global economy as measured by GDP. The quota also determines each member country's voting power. After the reforms the IMF's quota would double to $720 billion but the developed economy's quota and voting power would fall. 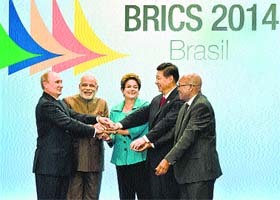 BRICS gave the IMF $75 billion for quota reforms in 2010 (with India contributing $10 billion) which have not taken place to date. If reforms do take place, China would become the third largest quota holder at the IMF and Brazil, Russia and India would all become top 10 quota holders. The AIIB will have voting rights based on benchmarks which will be a combination of GDP and purchasing power parity. Based on these China and India will be the biggest stakeholders. Since the AIIB has been perceived as a challenger of the two Bretton Woods institutions (IMF and World Bank), US Secretary of State John Kerry asked Australia to abstain from joining. Indonesia and South Korea as well as Japan also were absent from the group of 21. Considering India’s immense infrastructural needs, the AIIB has opened a fresh window for financing in which there will hopefully be fewer conditions and hassles. All other less developing countries will also be able to access loans easily which will help them strengthen their infrastructure which in 2012 required an estimated $8 trillion. Clearly, the developing countries are joining hands to create banks of their own and will have less to do with the monetary policies of the US and the stranglehold of the IMF and the World Bank on their economies. As a group, the AIIB will be powerful in leveraging funds from global financial markets and in general avoid the turmoil in the financial markets due to changes in the US monetary policy, especially important in the aftermath of the global financial crisis. Our neighbour’s son is a financial wizard. He is rarely seen during our waking hours whenever he is on a short visit from abroad. But whenever he is sighted, his father promptly calls me. He feels that our combined wisdom would make it easier to assimilate whatever he mumbles in his ever pre-occupied mode. But he always ends up saying the same thing — avoid the stock market and just invest in the senior citizen scheme or FDs. This obviously does not make sense, as our stock market is scaling new heights. His advice has always been that it is not a question of investing 10 per cent of one’s hard-earned savings into risky ventures but also the capacity to withstand and absorb financial shocks. And as fighting soldiers, you (his father and I) are not trained to handle more than the tremors of inflated electricity or club bills. We changed our strategy during our recent encounter. “How do the ‘funds’ make money?” we probed. Contrary to our expectations, he sat down and started explaining as to how it all works. The hedge funds function in a straightforward manner. They buy anything that would give them good returns: stocks, junk bonds, companies headed for bankruptcies and reviving them or any commodity which is going cheap. For once he was really warming up. He continued, “We bet on long or short positions and hedge our bets so that adverse positions are absorbed.” Our dazed look prompted him to explain that short or long positions are betting on the price going down or up. 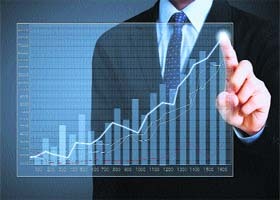 The mantra is to make money by keeping track of good bargains around the world. We, as professionals, like to give adequate returns to our clients, especially when the markets are in a tailspin. Both of us were thrilled that we had got his undivided attention for full ten minutes — each minute of his time probably valued at thousands of dollars. We discreetly slipped in a query as to the best buy at present. He mumbled that most of the good stocks were too high. We slumped but persisted that there must be something that may be worth considering. He stated the RBI Governor’s latest warning to the retail investors that there was a distinct possibility of the stocks taking a tumble because of the likelihood of a meltdown in the rich nations. He concluded that this was not the time to think of buying but selectively selling stocks. ‘But what about the time when a dip takes place,’ we laboured on relentlessly. “Difficult to say at this juncture but perhaps stocks dealing with energy, infrastructure and metals.” This was the time to take him head-on. We demanded as to how we could place order for shares of good shale gas companies. This was as per the prepared and rehearsed script as we know his stock response. He is ever willing to gift luxuries worth a fortune but never part with any worthwhile advice so that we could make our own pile. He was surprised but did not blink when caught off guard. He replied that that should be relatively simple. First get hold of an agent dealing with energy companies and place an order for E.T.Fs and Shale Rev & Energy Infra-structure and pay the margin money and walked off without explaining the nuts and bolts of the system knowing fully that it would be Greek or Latin to us. As a parting shot, he said, “Please stick to investing in government investment instruments”. We also did not blink. After all we are the ones who have brought up these intellectual brats. The Berlin Wall at the Brandenburg Gate on November 10, 1989. Pieces of the broken wall were displayed at museums later in London, New York and Paris. Amongst numerous junctures of history, the most seductive ones have been those where autocratic regimes in the last century, while pursuing their authoritarian agenda, have spuriously bandied about 'democracy,' as if they were reading out from a screenplay. In reality though, by repeatedly and self-indulgently calling their States 'democracies', yet in practice denying their people even the grant of fundamental minimum freedom in their day- to- day- life, these regimes had long engaged in preposterous hyperboles thereby perpetuating peoples' woes, and their own misdirection. German Democratic Republic, also known as East-Germany or GDR, was one such nation which ceased to exist on 3rd October 1990. It was a product of two historical realities. The first being the defeat of aggressive expansionism and totalitarianism of Hitler, whose aim it had been to create a new German state that would encompass most of Europe, at the hands of Allied Forces comprising the British Empire (including lakhs of Indian forces), the USSR and the USA. Hitler's rise was the result of the 1929 economic collapse of Wall Street, resulting in eight million German workers losing their jobs. Until then Hitler, a former corporal in the First World War; a failed painter, and an ambitious strategist, was considered to be a non-entity. Only after the recession and economic crash, directly or indirectly affected over 35 million Germans, creating economic devastation and spiralling inflation, anger and frustration that went with it, had the polity prepare a ground to give his ideas a chance. The second being the backlash of ideological conflict resulting in a prolonged cold war in Europe between the Soviet Union led 'East' on the one hand, and the USA and UK led 'West' on the other. The Berlin Wall became its most visible symbol. People who have not seen it in person, fail to realise, there had been two different walls or borders: One a 850 km long national boundary, a combination of fence and wall between the West-German and East-German states, and the other, more visible, the Berlin Wall, that had divided the city into West-Berlin and East-Berlin, and stood some 200 kilometres inside East-Germany. This monstrous edifice measuring 155 kms long and 3.2 to 4.5 meters high ring which had characterised the divided image of the city and visibly surrounded West-Berlin as an 'island of freedom', which Tom Wolfe had described as "obviously one of the historical epicentres of the twentieth century, this fantastic, medieval wall built in the mid-twentieth century dividing a city, a whole country in two, literally dividing brothers and sisters from brothers and sisters on the other side," had challenged the humanity day in and day out. In all its menacing, repressive glory the Wall had rendered here a boy stuck in East-Berlin with his mother and sister, while his father ended up in the West. It cleaved the city just as it had divided families. After the end of the WWII in May 1945, Germany was divided into four allied occupation zones. Its capital Berlin, which was located deep in the Soviet zone, was also divided into four zones. After the Allied powers in their post-war treaty talks failed to agree on the future status of Germany, the three western powers decided, in 1948, to unite their occupation zones into one autonomous state called Federal Republic of Germany. Annoyed, the USSR blocked all land routes to West-Berlin, hoping the western powers would abandon West-Berlin. Instead, the USA and UK launched a massive airlift of food supplies and fuel into the city lasting for months and forcing the Soviets to end the blockade in May 1949. By 1961 the cold war propaganda of the West supported by Marshal Plan investments on the one hand and the life under communist regime on the other caused widespread dissatisfaction among East-Germans. It resulted in mass exodus, at an average of some 2000 East-Germans; professionals, skilled workers and intellectuals daily into West-Berlin, amounting to 2.5 million people leaving GDR. This loss exerted a devastating effect on the East-German economy. On the night of 12th August 1961 the authorities reacted with immediate closing of the access points between East and West Berlin, laying down more than 30 miles of barbed wire through the heart of the city. Western threats of trade sanctions failed to have any impact on the Eastern resolve. It was on 15th August 1961, people in the East-Berlin were robbed of their freedom, as the barbed wire was now being replaced by a concrete wall up to 15 feet high, officially to "protect the East-German citizens from the pernicious influence of decadent capitalist culture". The walls were guarded with watch towers, machine gun emplacements, and mines. About 5000 East-Germans managed to escape across through a number of creative means, but thousands were captured while trying to flee, and 191 were shot or killed by accidents. Although the East-German state was called the German Democratic Republic, it was neither a democracy nor a republic, and had alienated its citizens. The GDR appeared to be an experimental state, whose microcosm we can visualise as best represented by an academic institute, where the academic research projects would stand for the socialist project that the GDR state truly embodied. But as a sovereign political entity as state, it lacked the dynamics of emotional and social relationships among people, whose dominant pragmatic lore can be seen represented in or compared to a sterile institutional dynamics. But how could a sense of patriotism prevail among people if they remained confined within walls where they wouldn't be allowed to travel outside the East bloc countries, fearing they might 'turn their backs on their country to never return? That level of state cowardice was staggering. In the subjectivity of everyday life, the objective world which the people in the GDR immediately experienced, like in its mentor state USSR, was in sharp contrast to the world projected as the distinguished and superior world, as projected in Marxism and Leninism. In the meantime, Gorbachev become the head of USSR in 1988 and realised the appalling state of Soviet economy and was passionately convinced of the need of widespread reforms. That involved the relaxation of rigid policies pertaining to the people and their work. This was perceived in Germany as a prospective opportunity towards reunification, or at least for travel relaxations. In the summer of 1989 many East-German tourists in Hungry occupied German and Austrian embassies and demanded permission to go to these countries. Soon mass demonstrations began to be held in the GDR. Erich Honecker (General Secretary, Socialist Unity Party) had to resign. Ultimately, on the night of 9th November, 1989, as the demonstrations achieved their peak in East-Berlin and in Leipzig, the check points to the West were thrown open. Soon people began to tear down the Wall. The Wende, as the fall of the wall leading to the German reunification is popularly called, had led to a gush of many intellectual voices seeking an immediate re-conceptualisation of their nation as a new, alternative political entity, which, they wanted should neither be communist nor a capitalist nation. But within months the popular majority tilted towards reunification powerfully pleaded and planned by Chancellor Helmut Kohl, and got dissolved into the stronger West. Earlier in 1988, as 2nd President of the Berlin Writers Association then in the western part of the Berlin, I, along with my two German colleagues, was entrusted by the Cultural Ministry of the State of West-Berlin to organise East-West Germans Writers Meet, which was agreed between Chancellor Helmut Kohl and the East-German leader Erich Honecker. We had a year's immunity to negotiate with the writers on the eastern side, which I had used by undertaking elaborate trips to understand the people and their plight. That event, the first ever such meet between the East and West German writers, took place in April 1989 in West-Berlin. In the concluding Press Conference I stated, that from what I have seen, experienced and discussed with people and writers in the East, this Wall would not last long. Six months later it had come true. On 3rd October 1990 the official celebration of German Reunification took place in the historic Reichstag, to which the then President of the German Parliament, Dr Rita Süsmuth, invited me and my colleagues as special guests. Aug 13, 1961: The border between East and West Berlin is closed and barbed wire and fencing is erected; concrete appears two days later. The wall would eventually grow to be a 96-mile barrier encircling West Berlin. Aug 15, 1961: Conrad Schumann, a 19-year-old East German border guard, was the first person photographed escaping to West Germany. About 10,000 people attempted escapes, and 5,000 succeeded. Aug 24, 1961: Gunter Litfin, a 24-year-old tailor's apprentice, was the first person shot dead trying to escape. Aug 19, 1989: The 'Pan-European Picnic' — a peace demonstration at the Hungarian town of Sopron on the Austrian border - turns into an exodus when Hungarian border guards hold their fire as 600 East German citizens flee to the West. 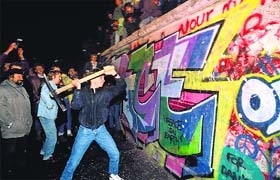 Nov 9, 1989: The Berlin Wall falls. The East German government announces that visits in West Germany and West Berlin are permitted. Thousands of East Berliners pass into West Berlin as border guards stand by.